Camp de Meucon. Balloon ascending. 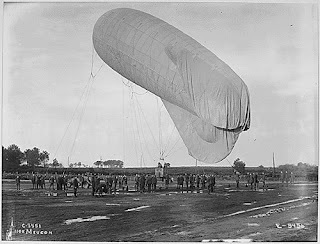 Before the tragic explosion of the Hindenberg, Dirigible travel was poised to become a common mode, but safety concerns and other issues overwhelmed the Blimp business. The Empire State Building's spire was originally designed for docking of Dirigibles!